This is the best string I have play with!!! Perfect balance of power, control and spin! Great comfort, touch and tension maintenance! I love that string so much!!! Let me know if you love it too!! After one year of trying so many strings and hybrids, my quest is over!!! And it is a SO GOOD feeling!!! Now I can be 100% focus on my game and stop thinking about strings!!! I'm in total confidence with my new setup. I was on the same boat, but I finally decided to stop switching strings and just bought a reel a few minutes ago. This way I can focus on my game and not on the 15 or so strings that this forum makes me want to try haha. 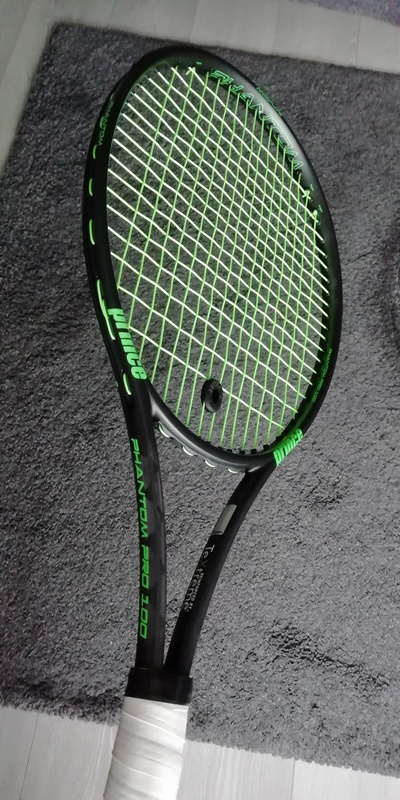 Whoops, forgot to clarify that I bought a reel of Yonex Poly Tour Strike. So is this in any way similar to hyper g just based on the color? I feel more power and control with X-perience and zero stress on the arm. It is soft but crisp. Not mushy at all. Exactly. It's a better Hyper-G in my opinion. Really better. I played with Hyper-G in my RF97A three years ago after taking off a year. I popped my wrist and had arm pain. I also didn't feel connected to the ball. My shots tended to go long by a foot and I couldn't tell where they were going to land. Control was unpredictable, in other words. Anyway, I also had an Achilles tendon injury and wound up taking off two years after that. Now I am trying to comeback again. X-Perience feels so soft and I have no arm pain using it. I was a USPTA Pro and #1 on my college team (30+ years ago -lol). So, arm pain is not due to my form. I never had it until trying poly string. Problem solved without having to us a multi or gut! I liked Hyper-G 18, personally. But X-perience is a "doped" version of Hyper-G. So good string!!! I used 16g Hyper G. It may have been a tension maintenance issue as well. As I string my own racquets, I will just cut out and restring when the time is right. I used to break strings often and even racquet frames when hitting in my late teens/early twenties. Not so much now but I can still blast the ball. I think poly is much tougher to break. I think poly is much tougher to break. How’s the control compared to Hyper G? I think X-Perience is much better. But I am comparing X-Perience 17g to when I used Hyper G 16g about three years ago. So, that was quite some time ago. I'm going to try X-Perience in 16g to see how much better the directional control is vs the 17g version. Pretty similar. Hyper-G has great control. But X-perience has also great control but with much better comfort and free power. And you must try 17L (1.18) gauge. Because gauges of X-perience are LOT thicker than normal. According with the Signum Pro's boss: "the X-perience is a hexagonal string, that means from flat to flat side it’s about 1,17 mm, from corner to corner 1,25 mm, so each manufacturer must decide finally at which diameter they sell it"
TW doesn't carry 17L gauge. I wonder why that is. It will come soon I imagine... And also reels... I hope for you, american people!! How is the tension maintenance of X-perience? Never tried Xperience but I bought a reel of the cheap Signum Pro poly and it was absolute hot garbage. Hybrid X-perience/Volkl sgut at 44/46 play SOOOOO GOOD!!!!!!!! Maximum comfort, easy power, great control and so easy DEEP spin!!! Now I have to see how much it last..... But it is THE GRAAL!!!!!!!!! Why not just a full bed of X-perience as it is so arm friendly? You don't need to hybrid it with a syngut or multi. Because I play A LOT and I want the MAXIMUM comfort I can find to preserve my arm in the long term. It is really the graal I was searching for long time!!! And it looks SO perfect in my PP100. Okay. Funny. I don't have arm issues with X-perience in a full bed. I do with other polys. So I will opt for the best performance I can get provided my arm is kept safe. And I preserve also a lot of money and the playability duration could be also longer. Lol. Same here. I want to deal with consistency and no testing variables. I want to deal with consistency and no testing variables. Same for me. And if that great hybrid play so well for minimum 10 hours at the same level, my consistency is going to be massive. Reel of Pro's Pro Synthetic 16 green ordered. 26€ shipping included is OK to do my final test. Ok just played with the 17g tonight. The durability is garbage. String broke after 2 sets and I’m not even a string breaker. What this string excels in is comfort. The control is surprisingly good for a soft poly. Power and spin are also decent. Too bad about the durability. Guess I’ll stick with Hyper G.
What frame and tension did you use? Where did the string break on the frame? I hit hard & up to 120 MPH serves (but not as often as when I was young). It didn't break on me yet but I've only put in a couple of sets myself. It was a misshit break. But I misshit often with other polys with no problem. Not one but TWO strings broke. I put it in the new Pure Aero at 57 lbs. Okay. Maybe 17g doesn't do so well at higher tensions in a more powerful frame? I lowered my tension down from 52/50 (other polys) to 46/44 using X-perience in my Pure Strike 98 16x19. I'm trying to go lower with whatever poly I use. I have a couple of sets of it in 16g and will test that out next once the rain stops. I want to see if I get a little more directional control & if the string is still arm friendly at 16g. Ok just played with the 17g tonight. The durability is garbage. How does the hybrid compare with full bed XP in terms of spin, power, and comfort? Comfort is totally awesome in my PP100. Even better than fb of X-perience, of course. I can swing so hard for long rallies with TOTAL confidence for my arm, wirst, shoulder, elbow, etc... And the big benefit is the added free power with the sgut. Power is so easy and totally controllable because my frame is so low powered. Heavy and bouncing spin is so easy to obtain!!! Again because I can swing so hard with all my strength without any fatigue and without the fear to lost control... It is a FANTASTIC playability!!!!!! But normally, if I don't break the sgut too quickly, the playability duration could be really better than fb of X-perience (or any poly in general), because with sgut as cross, the poly in mains don't die so quickly than fb. But with that setup, I play the best tennis of my life. And I can play it for long hours of match in tournaments, day after day... Like I'm doing this week. Nice. this is the Volkl 1.25 Classic Sythetic Gut in green, correct? And 1.30 retain tension better and is more durable. And don't string it too tight!!! 44/46lbs (20/21kg) is SO good for me! I am finding Gutex ultra better in the crosses than pp syn gut. Yeah I have read that too. But no green version... And I want a beautiful frame/stringbed. It is important for my confidence haha!! I will try that PP sgut green and if it is crap, I will stay with that great and beautiful Volkl sgut green. 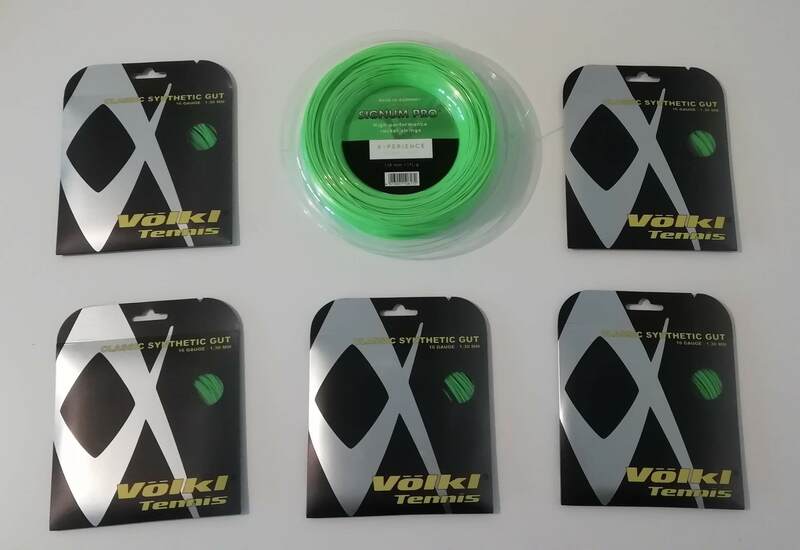 Volkl Classic Synthetic Gut green is discontinued!!!!!!!! Someone know a great sgut in neon green??? The color of the mains provide a higher mains to crosses color ratio, which will give you a 75.3429% confidence boost.